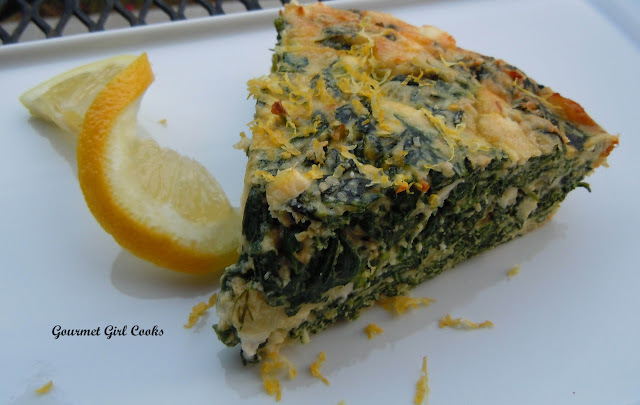 This evening I was in the mood for my Greek Style Spinach-Feta Pie, but I decided to put a different twist on it by making it crustless...."sort of". Rather than make the almond flour crust I typically make for this (which is super easy to make, by the way)...I decided to add some almond flour and Parmesan cheese inside the pie filling instead and make it a crustless pie. I also bumped up the egg and half-n-half a little to balance the almond flour and Parmesan cheese that was going to go inside the filling. It turned out good -- lighter than the regular crusted kind. I will admit, though, that I still prefer it with the crust...but this version was a nice and lighter change. I also added a lot more spinach than the recipe below calls for because I had a 16-ounce container of organic fresh baby spinach that I need to use -- so I just added the entire container...which is a LOT of spinach. 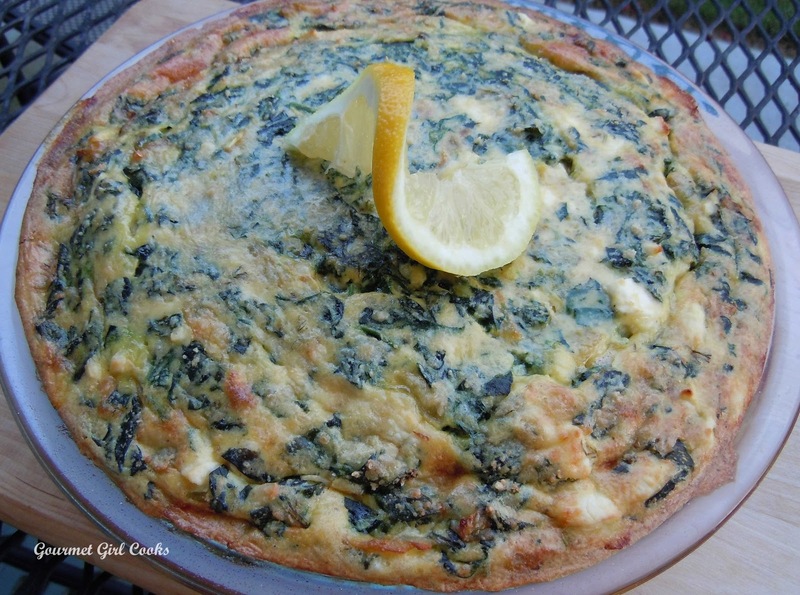 If you are a spinach lover it's a good thing -- if not, well...stick with the 10 ounces listed in the recipe (especially if your pie dish isn't very deep, because it will create extra volume and might not fit into your pie dish). If I would have added another tablespoon of filling to my large 10" pie dish, it would have overflowed -- it was that full with the extra spinach. Hubby and I are going to go and get our walk in now since it's such a beautiful evening. 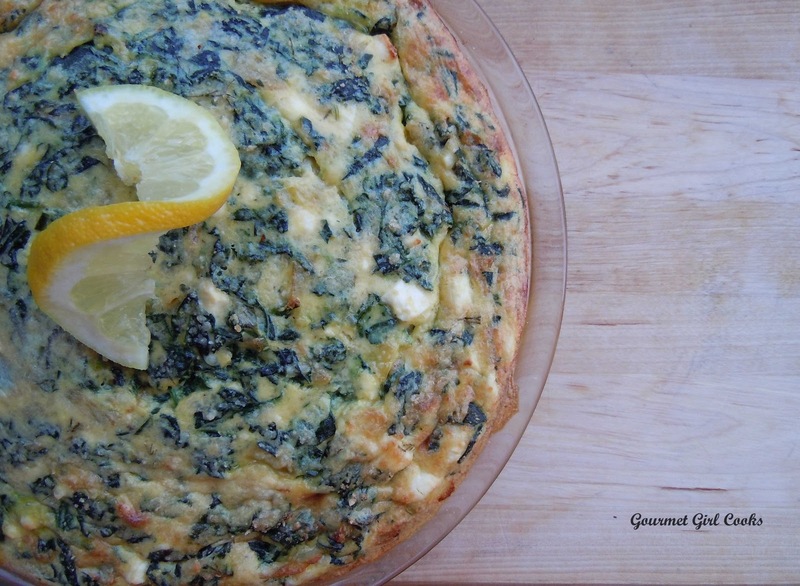 I snapped a few photos below as well as the modified recipe for the crustless version. Enjoy! Preheat oven to 350 F degrees. Lightly spray a pie dish or tart pan (I used a 10" pyrex pie dish) with olive oil spray. In a non-stick skillet, saute onions and garlic in olive oil until translucent; remove and set aside. 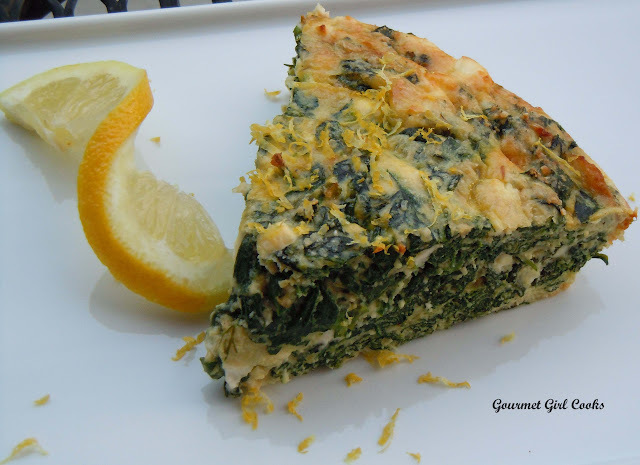 In the same skillet, saute spinach just until wilted. Drain and press as much of the liquid out of the spinach as possible (I use a mesh strainer and press it with the back of a spoon). 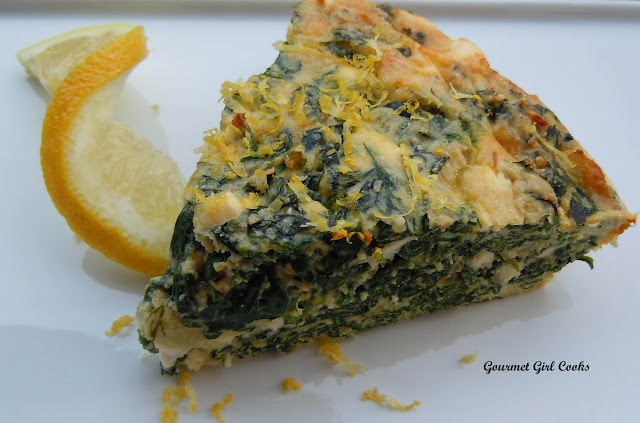 Place well drained spinach in a medium bowl; add cooked onions and garlic, feta, dill, lemon peel, pepper, eggs, half-n-half, almond flour and Parmesan cheese. Mix until well combined. Pour mixture into the lightly greased pie dish and bake at 350 F for 40 to 45 minutes, or until filling and eggs are set and cooked through to the center of the pie. If the center still seems a little jiggly, cook an additional few minutes. Is there any reason the your original spinach-feta pie couldn't be baked without a cust?